We were driving up a particularly steep hill, and the Partnerin, obviously forgetting where she was, asked "What do the locals do when it snows?" This is the waiting area at the local commercial airport. They do have screeners and security and all that, but they did seem a little bit friendlier, probably because they are in fresh air and sunshine on most days. One wonders what they do on a really rainy day ... if they have those in Kona. 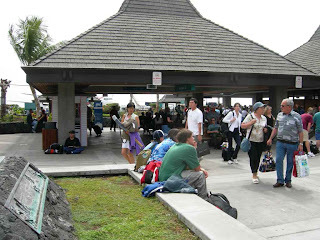 The Partnerin told me she experienced a rainy day in the town of Kailua Kona while I was at the airport flying one day, but I think I could have kept a running count of the raindrops I saw in three weeks if I had really tried, which is a long way of saying that I don't think they get many rainy days at this airport. Frankfurt still has the aircraft parking spots where you walk across the tarmac and clmb up stairs to the plane, but almost always at the end of a bus ride from the terminal (by the way, Fraport, why do you make me walk all the way to the farthest gate in Terminal B just to put me on a bus out to the plane). Anyway, here you are always within 100 yards of your aircraft ... no buses necessary. This, by the way, is an International Airport, and they do process things as big as 747's on their way to distant lands. Hard to believe, no?